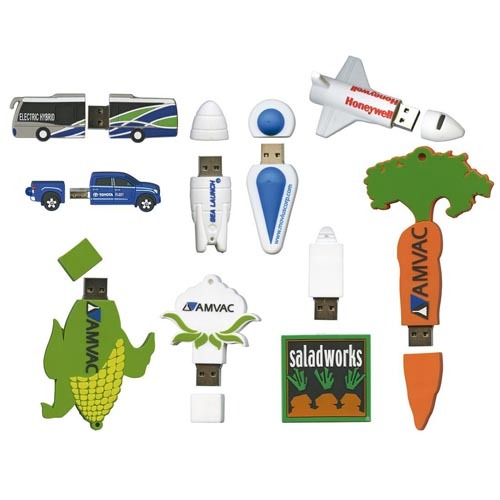 Below is our range of USB Flash Drives that make excellent promotional gifts. We can organise for your digital data to be uploaded on to all your drives, lead times and costs apply, please enquire. The uploaded information can be read only or read/write (deletable). There are a variety of branding methods that we use and also plenty of display options. 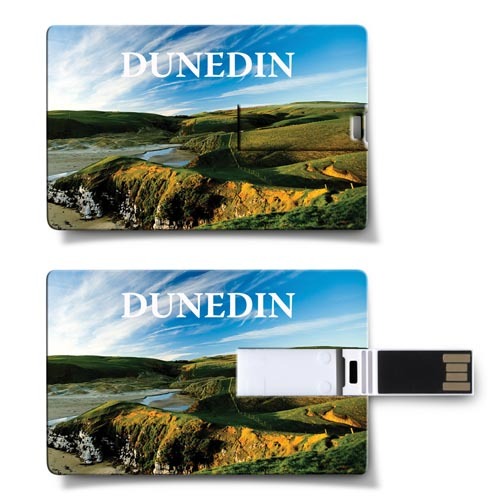 Most of our USB Flash Drives can be printed and distributed from within New Zealand hence you get a quick delivery, within 5 - 10 days of the artwork being signed off as being accurate. We can also organise that the Drives come direct from our factories overseas saving a lot of money and also giving you more choice of colours. In addition, we can facilitate a special design USB Flash Drive so you get any shape you desire and have it made in soft moulded PVC. Each print job has a setup fee of $66.50 plus GST or if it is a repeat of a previous job with no changes it is $47.50 Click here to go back to EPI Plastics Homepage. Click here to go back to EPI Promo Homepage. Design your own flash drive to match your corporate colours with 132 ex stock colour combinations to choose from in the 1GB range. We also have 2GB, 4GB, 8GB and 16GB flash drives and these can be ordered in any of the colour combinations on indent from overseas. 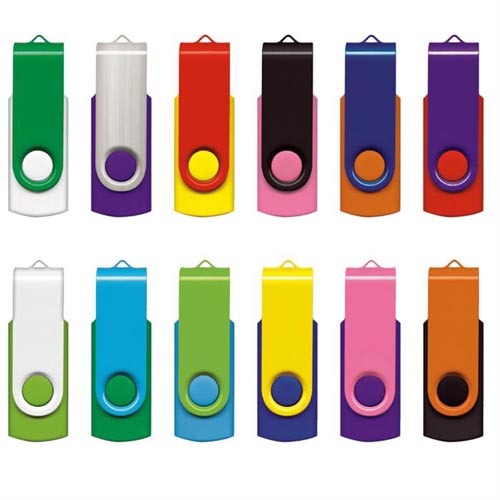 The larger capacity USB drives are available ex stock in NZ but only with a black case (but 12 swivel colour colour options). 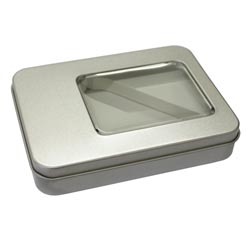 They are supplied in bubble wrap, there are a number of display gift box options available. See below. The drives can be decorated with a number of branding options including pad print, full colour print, laser engraving and stylish resin coated domed finish. We can organise for your digital data to be uploaded on to all your drives, lead times and costs apply, please enquire. The uploaded information can be read only or read/write (deletable). Dimensions 56mm x 20mm x 10mm. Print or engraving area: 25mm x 12mm, Resin Coated Dome finish size 40mm x 15mm. Pad printing per colour/position 57c, Full colour print per position 57c, Engraving 57c, Full colour resin dome 86c. Display options see further down the page. Note. Prices tend to be exclusive of GST on this website. Each printing job has a setup charge of $66.50 per colour and position, note full colour printing options only have 1 setup charge. If the job is a reorder and there are no art changes, the setup cost is $47.50 per colour and position. First 30 minutes of artwork is covered in the setup charge, If additional artwork and design is required this is charged out at $75.60 per hour. Most simple jobs will not cost more than the $63.00 setup above. 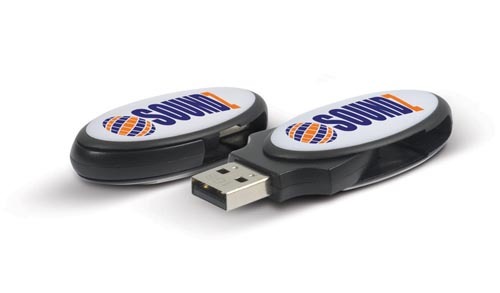 Turn the Credit Card Flash Drive into an advertising billboard or collector's item with your own stunning full colour graphics. 1GB with USB 2.0 ,we also have 2GB, 4GB, 8GB and 16GB flash drives available on indent from overseas (lead times apply). They are supplied in bubble wrap. Full colour printing is the branding option. We can organise for your digital data to be uploaded on to all your drives, lead times and costs apply, please enquire. The uploaded information can be read only or read/write (deletable). Dimensions 56mm x 20mm x 10mm. Print area: 85mm x 54mm plus bleed if required. Unprinted Flash Drive colour - white. Full colour print per position 57c. Note. Prices tend to be exclusive of GST on this website. Each printing job has a setup charge of $66.50. If the job is a reorder and there are no art changes, the setup cost is $47.50. First 30 minutes of artwork is covered in the setup charge, If additional artwork and design is required this is charged out at $75.60 per hour. Most simple jobs will not cost more than the $63.00 setup above. 1GB with USB 2.0, we also have 2GB, 4GB, 8GB and 16GB flash drives available on indent from overseas (lead times apply). 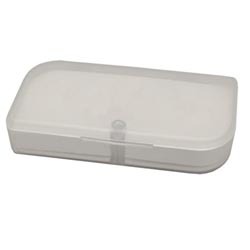 They are supplied in bubble wrap, however there are are a variety of display gift box options. Pad print with single colours or full colour printing are the branding option. We can organise for your digital data to be uploaded on to all your drives, lead times and costs apply, please enquire. The uploaded information can be read only or read/write (deletable). Dimensions 59mm x 18mm x 9mm. Pad print area: 25mm x 10mm. Full colour print area 27mm x 10mm. Pad printing per colour/position 57c, Full colour print per position 57c. Display options see further down the page. Note. Prices tend to be exclusive of GST on this website. Each printing job has a setup charge of $66.50 per colour and position, note only 1 setup charge for full colour printing. If the job is a reorder and there are no art changes, the setup cost is $47.50 per colour and position. First 30 minutes of artwork is covered in the setup charge, If additional artwork and design is required this is charged out at $75.60 per hour. Most simple jobs will not cost more than the $63.00 setup above. Dimensions 59mm x 18mm x 9mm. Pad print area: 25mm x 10mm. Full colour print area 40mm x 13mm. Note. Prices tend to be exclusive of GST on this website. Each printing job has a setup charge of $66.50 per colour and position (note only 1 setup for full colour). If the job is a reorder and there are no art changes, the setup cost is $47.50 per colour and position. First 30 minutes of artwork is covered in the setup charge, If additional artwork and design is required this is charged out at $75.60 per hour. Most simple jobs will not cost more than the $63.00 setup above. 1GB with USB 2.0, we also have 2GB, 4GB, 8GB and 16GB flash drives available on indent from overseas (lead times apply). 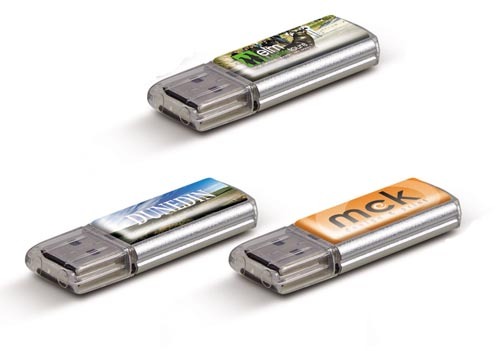 Swivel USB with branding options on both sides. They are supplied in bubble wrap, however there are are a variety of display gift box options. Pad print with single colours or full colour printing with resin coating are the branding option. We can organise for your digital data to be uploaded on to all your drives, lead times and costs apply, please enquire. The uploaded information can be read only or read/write (deletable). Dimensions 53mm x 25.4mm x 14.6mm. 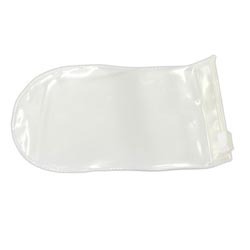 Pad print area (Oval Shape): 35mm x 15mm. Full colour print area 40mm x 20mm. Print Cost: Full colour resin dome 86c. Display options see further down the page. Note. Prices tend to be exclusive of GST on this website. Each printing job has a setup charge of $66.50 per colour and position. If the job is a reorder and there are no art changes, the setup cost is $47.50 per colour and position. First 30 minutes of artwork is covered in the setup charge, If additional artwork and design is required this is charged out at $75.60 per hour. Most simple jobs will not cost more than the $63.00 setup above. Clear with silver trim flash drive. 1GB with USB 2.0, we also have 2GB, 4GB, 8GB and 16GB flash drives available on indent from overseas (lead times apply). Can be branded in full colour on both sides with a resin coated finish. They are supplied in bubble wrap, however there are are a variety of display gift box options. We can organise for your digital data to be uploaded on to all your drives, lead times and costs apply, please enquire. The uploaded information can be read only or read/write (deletable). Dimensions 52mm x 15mm x 5mm.Full colour print area 30mm x 13mm. Full colour resin dome 86c. Display options see further down the page. High quality genuine leather and metal construction. 1GB with USB 2.0, we also have 2GB, 4GB, 8GB and 16GB flash drives available on indent from overseas (lead times apply). Can be branded in full colour on both sides with a resin coated finish. They are supplied in bubble wrap, however there are are a variety of display gift box options. We can organise for your digital data to be uploaded on to all your drives, lead times and costs apply, please enquire. The uploaded information can be read only or read/write (deletable). Dimensions 86mm x 25mm x 18mm. Pad print area 30mm x 10mm. Pad printing cost per colour/position 57c. Display options see further down the page. 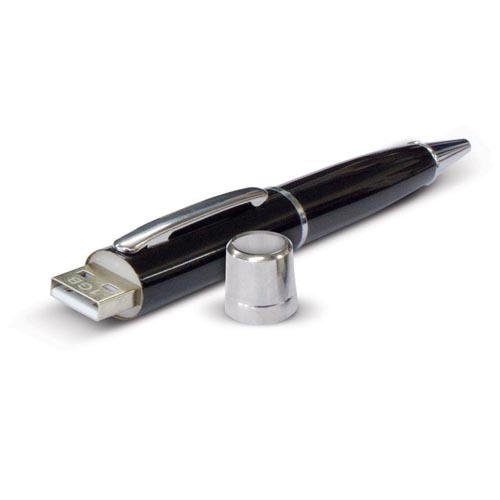 1GB flash drive incorporated into a functional pen. USB 2.0, we also have 2GB, 4GB, 8GB and 16GB flash drives available on indent from overseas (lead times apply). Pad printed on the cap or barrel. They are supplied in bubble wrap, however there are are a variety of display gift box options (see the pens section for display boxes). We can organise for your digital data to be uploaded on to all your drives, lead times and costs apply, please enquire. The uploaded information can be read only or read/write (deletable). Dimensions 140mm x 18.1mm x 14.6mm. Pad print area, cap 40mm x 8mm, Barrel 40mm x 7mm. 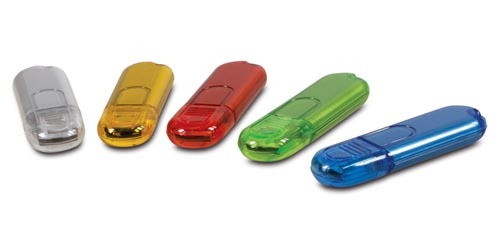 Design your own 3 dimensional flash drive in any shape you desire and have it made in soft moulded PVC. Just give us a brief and we will do the rest. The minimum order is only 500pcs and memory size is from 1GB to 16GB. They are supplied in bubble wrap, however there are are a variety of display gift box options (see the section below for display boxes). We can organise for your digital data to be uploaded on to all your drives, this is done overseas and lead times and costs apply, please enquire. The uploaded information can be read only or read/write (deletable). Mould cost $370.50. Dimensions: up to you. Prices above include the printing. There is a one off mould cost of $370.50, this isn't repeated in the future if you use the same mould. Excludes the USB Flash Drive, this is sold separately, see above. Holds the Nano, Oval, Quadra, Helix and Apollo. Colour - Frosted Clear. Dimensions 95mm x 46mm x 22mm. Pad print area, 60 mm x 20mm. Pad printing cost per colour/position 57c. Excludes the USB Flash Drive, this is sold separately, see above. Holds the Vector. Clear with Silver trim. Dimensions 126mm x 88mm x 22mm. Pad print area, 55 mm x 20mm. Excludes the USB Flash Drive, this is sold separately, see above. Holds the Nano, Oval, Quadra, Helix, Vector and Apollo. Colour - Frosted Clear. Dimensions 71mm x 23mm x 7mm. We do not print this product.